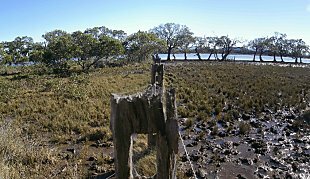 Why exclude stock from riparian zones? improved aesthetic qualities of the farm. 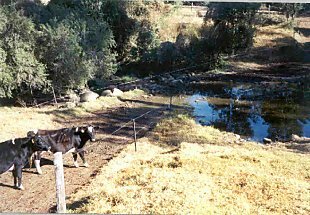 Dairy cows are able to cross the creek and drink without further damaging the riparian vegetation. 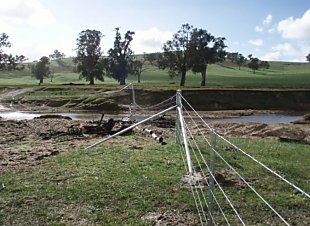 When fencing the riparian zone a variety of issues need to be taken into consideration that would not apply to the rest of the farm, including flood risk and remoteness to the site for power supplies. Fences should be placed at least 10-20m from the current bank. The official NSW DPI Fisheries recommendation is 20m. The further away the fence is placed the straighter it can be. This requires less material and less time to erect therefore reducing the capital cost of the fence and increasing environmental benefits. If the purpose of fencing is to provide habitat for wildlife, a minimum width of 30-50m is recommended. The width required for a functional buffer zone is influenced by the slope, the flood patterns of an area, the amount of sediment present, the sediment type, and whether sediment containing run off will be concentrated into a channel or dispersed evenly over a large area. Sacrificing land alongside waterways will reduce future soil loss from erosion. Fencing further away from the waterway, parallel to the anticipated direction of flood flow tends to result in less fence damage. 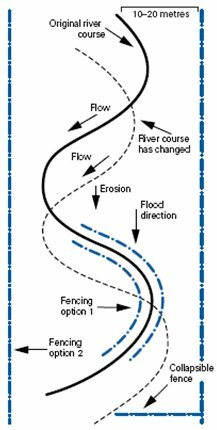 If fencing across the flow direction cannot be avoided, options include erecting a short section that automatically drops flat, can be manually dropped or “blows out” in times of flood. Simple one to two plain wire fences with fewer posts are less likely to collect debris as the flood waters pass through, therefore less likely to be swept away. If they are swept away the financial loss will be reduced. Fencing above the flood level, creating a “river paddock” for crops and periodic crash grazing or drought fodder reduces the maintenance costs of fences in flood areas. Use a suspended “hanging” fence across streams and gullies, ensure this section is capable of “blowing out”, is separate from other sections of fence and strong enough to support the additional weight (use high tensile wire). Corrugated iron, planks, chains and even light weight garden mesh can be suspended across the waterway. For dry stock put fence wires on the downstream side of posts so they pop their staples and drop rather than breaking, and use un-barbed staples so wires can pop more easily to three wire. An example of flood fencing across Tarcutta Creek. Photo: Luke Pearce. There are a range of fencing options and the type used will depend on the purpose, topography, size of the area, soil type, flood risk, stock type, material availability and cost. Can be dropped or removed for weed removal. Less likely to collect flood debris. Comparatively cheap to erect and maintain. Not adequate for sheep and lambs. Droppers may be needed depending on post spacing. Can be dropped or removed for weed control. Still less likely to collect flood debris. May not be adequate for lambs. Costs increase with wire increase. Effective against most stock (including lambs). Limited ability to follow natural stream curve. Requires more posts and droppers. Not as effective in stock control. Very effective in stock control (especially lambs). Contain “inbuilt” droppers reducing costs. Prone to collect flood debris. The cost of erecting a permanent electric fence is approximately half that for a conventional or suspension fence. When properly constructed and maintained electric fences are the least expensive and most effective fences for riparian zones. Drop fences: Designed to either be manually dropped before a flood or drop from their anchor points and fold down when under the pressure of floodwater and debris. Electronic fences: The stock wear a receiver and transmitter boxes are located to form a boundary between the riparian area and the rest of the paddock an “invisible fence”. The receivers respond by producing an audio signal and then an electric stimulus to the animal’s ear if it attempts to enter the riparian area.